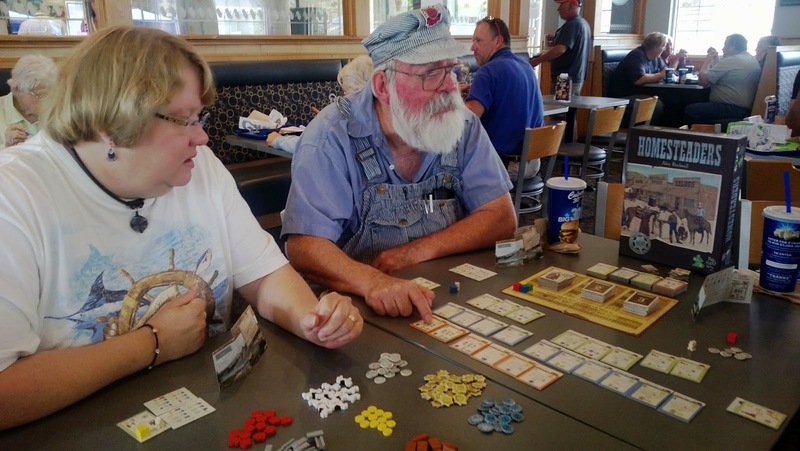 For the last two Fridays, I have had the chance to try out a game from 2009 called Homesteaders from Tasty Minstrel Games. I've enjoyed both times I've played and have managed to improve my score from the first game to the second. 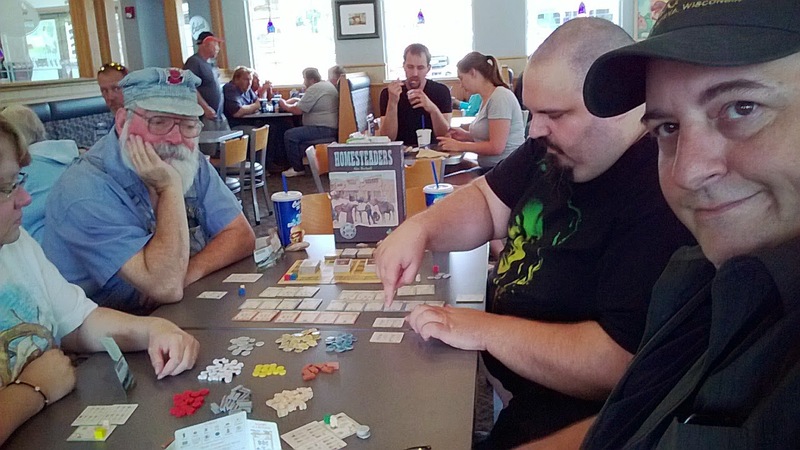 I blogged about this game last Saturday here and thought it might be nice to do a quick followup blog. It is noteworthy that we had four players instead of three, so there was an additional auction block available. This makes vying for them slightly different but neither easier nor more difficult, as far as I could tell. There is a bit more competition for the various properties but there are so many of them I am not sure that makes much difference. The Bank property which allows removal of Debt, as well as the Circus which is a 10 point card (there are also a couple of 8 point cards) seemed like a huge deal in my first game but I am thinking less so. They can be the center of one strategy or another but need not be part of every strategy. I stayed sheepish about Debt and managed to get rid of all but one (one victory point lost, compared to losing four points for two, losing nine points for three, etc.). Debt, however, didn't feel as important this time around. Perhaps my eyes weren't so wide, so I wasn't as anxious to purchase properties that might have incurred Debt. Or maybe because I got a decent score in my first time playing and managed the Debt well enough I no longer felt compelled to worry. I've played some games where I have pushed the limits of what can be done with taking on Debt and have yet to see a game where you can break that mechanic. This time around I made a concerted effort to gain an average of four Victory Points per turn and wound up averaging nearly five VP per turn. To do so, I decided to be snapping up VPs every turn I could, provided it didn't cause me to be doing absolutely no other things. I still bought properties, I made trades sometimes when flush with Trade Markers, just to gain a VP or two. In Kingsburg, folks know me as the player who rarely passes up the #1 spot for a victory point. I played Homesteaders in a similar fashion and Tom even commented on my strategy immediately upon gathering a VP on the first turn. "Leave it to Mark to do something different than the rest of us on turn one." But perhaps that is how this strategy happened to win. Maybe it isn't because it is such a good strategy on its own but only in conjunction with strategies from other players who are doing something that does not restrict it overly? Time will tell. All in all, I could see myself playing this game on a regular basis. We'll see how I feel after a handful more times with Homesteaders (2009).